NORWALK, Conn. – Glowing reviews flowed last Tuesday for the middle school redesign effort that Norwalk Public Schools began this year, after much resistance to the idea last spring. 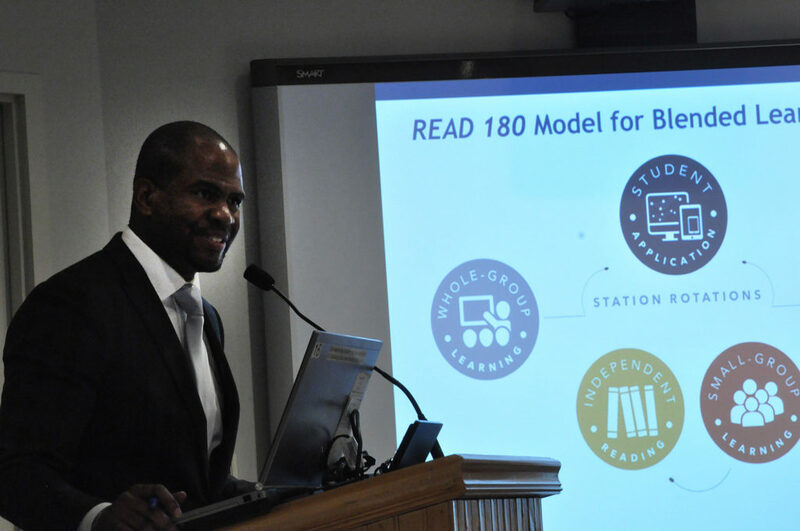 Bain, who flew in from afar for Norwalk’s meeting, was the second speaker in an extensive review of this year’s middle school redesign result data, which was followed by a look ahead to what comes next. His comments were not an anomaly. The talk was accompanied by extensive data, with talk of comparative percentiles on results on the implementation of System 44, “the most intensive intervention,” according to Bain, Read 180 and Math 180, with NWEA (Northwest Evaluation Association) MAP (Measure of Academic Progress) results to verify the claims. “The movement of these struggling students was dramatic,” Bain said, describing it as double for the cohort nationally. BoE Vice Chairman Mike Barbis said the numbers were “crazy” and asked Bain what produced the surprising results. System 44 is for students who are at a first grade reading level, although they are in middle school, he said. Nathan Hale Middle School Principal Albert Sackey also spoke, briefly explaining the Teach to One math program, which he selected last year as the major feature of the school’s redesign. It’s personalized math instruction for every child, he said. Superintendent of Schools Steven Adamowski encouraged BoE members to go see a Teach to One class in action. “I think you’ll be extremely impressed. I think you’ll also see students are learning to become independent learners, the confidence level of students in a subject that is not the natural inclination of many of us. It is incredible,” Adamowski said, crediting the Dalio Foundation for funding the effort. Teach to One will not move to other schools just yet, as administrators would like to get all grade levels at Nathan Hale onto the program first, Adamowski said. Creller described block scheduling as a success, to the point that administrators would like to speed up its implementation from a three year phase in to a two year transition. In a slightly negative note, Adamowski said that Norwalk’s high achieving middle schoolers have not grown at the rate as those who require interventions. “You have to begin somewhere, you begin with the students most in need,” Adamowski said. BoE Chairman Mike Lyons said he’d gotten an email from a middle school teacher who is expected larger class sizes next year. Norwalk Federation of Teachers (NFT) President Mary Yordon and NFT First Vice President Joe Giandurco both said the progress is good, but expressed caution. Yordon said the changes are exciting and energizing, but there are many new things to learn and professional development is needed. Teachers are gaining experience with NWEA testing but there are gaps and potential problems, he said. “Where is the PD (professional development)?” he asked.